As a tennis coach, continuous education is part of improving my knowledge and skills so that I can stay relevant and ensure that my coaching is effective. As such, I constantly look out for great tennis product to learn. If they are excellent, I will definitely recommend to others so that they benefit from the product. The tennis serve is the most sought after technique that players want to perfect yet the serve is also the most difficult and complex skill to master. Recently I had the privilege to access Tomaz Mencinger’s latest tennis serve course, “Serve Unlocked”. 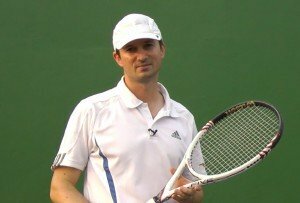 After going through the course, I have decided to write a full review and recommend this excellent course to any tennis players who want to improve their tennis serve. Tomaz started playing table tennis at the age of seven and recreational level tennis at the age of 14. Although he was unable to become a professional tennis player, Tomaz nearly made it to that level in volleyball. Upon writing this, I feel that my background is quite similar to Tomaz. Both of us trained intensively in the game of volleyball when we were younger. The sports are much different, but also have some similarities when it comes to the mental approach that is needed to succeed. When he was 23-year old, Tomaz became a certified tennis coach and starting working with aspiring tennis players in Slovenia. It was at this time that he started working on the psychology of tennis, as he believes that this is perhaps the most important aspect of becoming a successful player. His ideology is that enough tennis coaches around the world teach tennis technique, but very few of them work on the mind of a tennis player. Once a tennis player masters the mental aspect of the sport, such as timing, rhythm, ball judgment and feel, the rest of the skills will fall into place. Learning the methods that Tomaz teaches provide an important advantage because they allow the player to react instinctively. Rather than over thinking each movement, the player is able to maximize his or her performance effortlessly. Enough of evaluating the credentials of the creator, let us look at the course. The tennis serve is a very difficult skill to unlock because so much goes into it. Your body must work in perfect harmony to get transfer energy properly, which will allow you to deliver an accurate and powerful serve. The serve is about more than the point of contact, as every movement that leads up to that point is equally important. Tomaz's system teaches players how to imagine the path of the racquet as it approaches the ball, which creates consistency when serving. When the mental aspect of the serve has been mastered, the ball and the racquet will meet at the ideal point, which will improve your serve. A common problem with the tennis serve is that people put too much work into it. Much like using a driver in golf, the harder you try, the more problems you will encounter. The stroke used when serving is fundamentally different from any other stroke you will use in a match, which is an important idea to remember. In this section, Tomaz teaches you how to unlock your mind, it starts with your idea of how the serve should look. Once you have the correct mindset, it becomes much easier for your body to adapt. This allows you to move beyond any physical limitations that you might have, as the mind is much stronger than the body. In my opinion, the reason why this serve course is so outstanding is because of this section. The number of videos is also the most in this section. This shows that the emphasis of the mind is so important in unlocking your serve. In this section, there are 7 videos that addressed this issue. Many simple and effective drills are presented to help you unlock the wrist. By loosening your wrist, the tennis serve becomes much more natural, like throwing a baseball. Changing your grip on the racquet also helps you to generate more power, as it accelerates the head of the racquet during your stroke. The wrist is very important to the serving motion and by training your mind to unlock the wrist, you will begin getting much more out of your service game. Here is a sample video from this section. The key to generating power is not how hard you swing the racquet, but rather how fast the head of the racquet is moving when it makes contact. These are not the same, as swinging too hard can actually limit the racquet's speed at the point of contact. Serve Unlocked teaches players how to develop a whipping motion that will naturally transfer your energy through the ball, which increases your serve's velocity. Want to discover how to achieve the whipping effect on the serve? Tomaz presented the solution pretty easily using a towel. Go to this section to find out more. This is a great section for learning how to generate power on your tennis serve. If you think that a powerful is done by just swinging the racket hard at the ball, then you are wrong. Tomaz teaches you how to understand the energy flow and how to make use of your legs to generate the energy. After using the legs, then what’s next? What is the rhythm to connect the backswing with the forward acceleration? This bonus section is very very valuable. Why I use double “very” because I want to emphasis that this section is a “must watch” section. There are too many tennis players having problems with their toss. I am glad Tomaz addressed the most common mistakes that cause a poor ball toss on the serve. There are many coaches that always try to correct a student’s toss by saying “throw higher”, “toss the ball in front of you” or “toss the ball above your head”. I think these cues do not really help much in correcting the toss. Tomaz presented a simple analogy of how to place the toss by visualising a mental image. I have tried it out with my students and it worked immediately. Check out this section to find out what analogy he used. With 43 videos and over 2.5 hours of video material, Serve Unlocked is an excellent course for beginners and experts alike, as players of all skill levels can improve their tennis serve. I find myself playing videos after videos because there are so many interesting points about the tennis serve. By combining your mind with a more flexible wrist, you can change your serve in ways that you never would have otherwise dreamed. This course has helped countless players on the professional tour transform their serves and it is now available to the general public. Try Serve Unlocked to give yourself an advantage in every tennis match that you play. Having a great serve is the benchmark of a great tennis player because it allows you to put your opponent on the run immediately. If you have struggled with your tennis serve in the past, Serve Unlocked by Tomaz Mencinger is your best investment to make an immediate and permanent improvement. From "Tennis Serve Course Review : Serve Unlocked" To "How To Play Tennis Efficiently And Become A Better Player"